In the end mirrorless is the future! Competition is good. Exciting time ahead!!! Seems like the S1 is a GH5 in a full frame? Again a new mount announced in few weeks?!? That's all? Or Olympus will come soon with something ? Frankly this is a mess, we'll have to be stuck with on brand. or just keep buying EF mount that should be compatible with the three new comers. Impossible to say just yet, interesting tho! But I think the current options we have ie gh5 and canon 1dx m2 etc are plenty sufficient, at least for underwater use. Eventually somebody will make an adapter convert Canon lens to L-mount so as long as the camera body is popular and in demand, it shouldn't be a problem. All of them are strong competitor and all of their mounts are patented hence you have to pay licenses to use it. So "owning" your mount is a savvy decision. Panasonic owns Leica. full-frame Leica SL and APS-C Leica CL and TL-series cameras use L mount already so it makes sense using it. Canon and Nikon had to introduce a minimum set of lenses along with their new mirrorless cameras. Panasonic will adopt the same strategy but it can already use the 10 Leica lens already available. 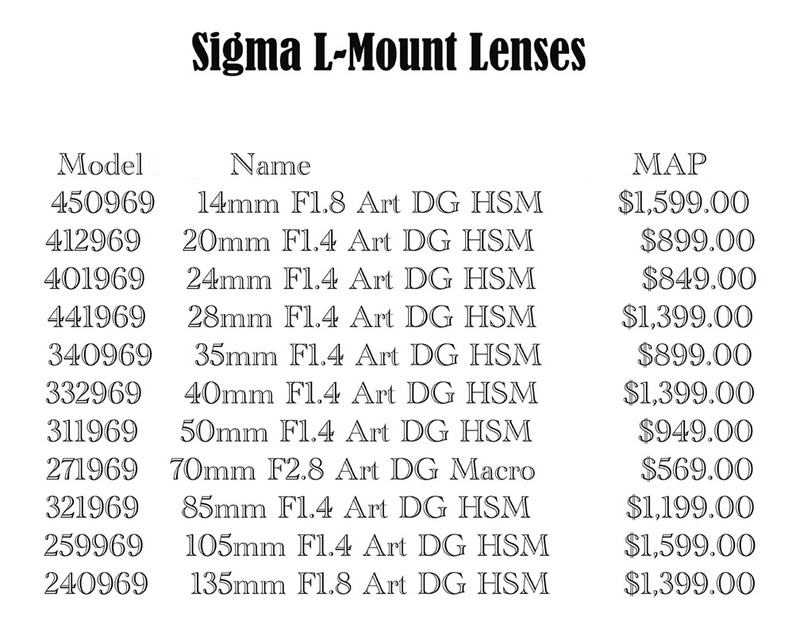 Moreover, with the Sigma alliance will have affordable lens asap: Sigma needs "simply" adapt their existing lens to the new mount. Edited by Davide DB, 26 September 2018 - 01:27 AM. Ok anyway no hurry to go with any new “system” as only few lenses will be available for a while from any camera maker. Also no one have yet announced anything better than the GH5/S can deliver in term of codec, apart from Fuji with their XT-3 and Blackmagic with their BMPCC 4K. There is just a bit of confusion in term of the camera line up roadmap. The Panasonic S1 and S1R is 4K60fps. But isn't Panasonic has the goal to create 8K camera by 2020 Summer Olympics in Japan? If they release S1 and S1R in 2019, would a 8K camera release in 2020? That seems to be too close in term of flagship camera roadmap. I don't think 3/4 sensor is capable of doing 8K, so I don't think they will put 8K on GH6. I'm just surprise the S1 and S1R doesn't do 8K as it could give RED for a run of competition. Only the SR1 could deliver 8K but did Panasonic said 8K on mirrorless camera? I think that's only for camera like the EVA or higher models. Also for 8K what media is needed? should need a very high speed, especially if you want 10bits. I think that's not tomorrow you'll see 8K on mirrorless camera. Cameras seen at Photokina are just (ugly) 3D printed mockups. IMHO it was move trying to stop/pause people from jumping on the Canikon bandwagon: a way to say "I'm here too". I'm under the impression that specs will change a lot before we will see a real SR1 on the block. Edited by Interceptor121, 29 September 2018 - 11:21 AM. So Pana S1 is on the market and it's plenty of test and review out there. Any rumors on future Nauticam housing for this little monster? A friend of mine who is a long GH user (land shot) grabbed one S1 and he is impressed form the results.